Provides entry-level overview of every form of radioactivity including natural and artificial sources, and radiation of cosmic origin. CHOICE Magazine, July 2008: "This work provides an overview of the many interesting aspects of the science of radioactive decays, including in-depth chapters that offer reminiscences on the history and important personalities of the field ... The book can be useful as supplemental reading or as a reference when developing course material for nuclear physics, nuclear engineering, or health physics lectures. 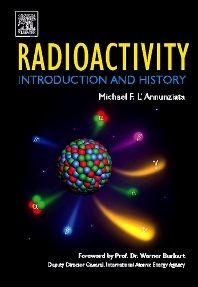 Special attention has been given to a chapter on the role radioactivity plays in everyday life applications...Generally the book is well produced and will be a valuable resource for the history of radioactivity. Many lectures can be lightened up by including material from this work. Summing up: RECOMMENDED. Upper-division undergraduates through professionals; technical program students." --U. Greife, Colorado School of Mines, USA "I found the biographical accounts of the various stalwarts of Physics inspirational. Most of them, if not all, had to overcome economic hardships or personal tragedies or had to do their ground breaking work in the face of tyranny and war. The biographies also highlighted the high standards of moral convictions that the scientists had as they realized the grave implications of some of their work and the potential threat to humanity. This ought to inspire and motivate young men and women aspiring to be Physicists. Even people who have been in the field for a while should find your book re-energizing. It certainly had that effect on me." --Dr. Ramkumar Venkataraman, Canberra Industries, Inc., Meriden, CT, USA.